“Groovie Movie” by Metro Goldwyn Mayer, 1944. Funny jitterbug instructional video. 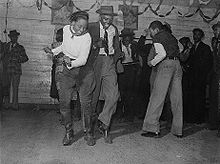 The Jitterbug is a kind of dance popularized in the United States in the early twentieth century and is associated with various types of swing dances such as the Lindy Hop, Jive, and East Coast Swing. Norma Miller wrote, however, that when “tourists” came to the Savoy, they saw a rehearsed and choreographed dance, which they mistakenly thought was a regular group of dancers simply enjoying social dancing. 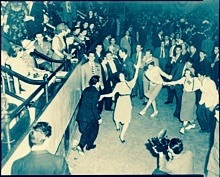 One text states that “the shag and single lindy represented the earlier popular basics” of jitterbug, which gave way to the double lindy when rock and roll became popular. A number called “The Jitterbug” was written for the 1939 film The Wizard of Oz. The “jitterbug” was a bug sent by the Wicked Witch of the West to waylay the heroes by forcing them to do a jitterbug-style dance. Although the sequence was not included in the final version of the film, the Witch is later heard to tell the flying monkey leader, “I’ve sent a little insect on ahead to take the fight out of them.” The song as sung by Judy Garland as Dorothy and some of the establishing dialogue survived from the soundtrack as the B-side of the disc release of Over the Rainbow. In 1944, with the United States’ continuing involvement in World War II, a 30% federal excise tax was levied against “dancing” night clubs. Although the tax was later reduced to 20%, “No Dancing Allowed” signs went up all over the country. Jazz drummer Max Roach argued that, “This tax is the real story why dancing … public dancing per se … were [sic] just out. Club owners, promoters, couldn’t afford to pay the city tax, state tax, government tax. World War II facilitated the spread of jitterbug across the Pacific and the Atlantic Oceans. British Samoans were doing a “Seabee version” of the jitterbug by January 1944. Across the Atlantic in preparation for D-Day, there were nearly 2 million American troops stationed throughout Britain in May 1944. Ballrooms that had been closed because of lack of business opened their doors. Working class girls who had never danced before made up a large part of the attendees, along with American soldiers and sailors. 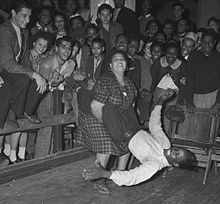 By November 1945 after the departure of the American troops following D-Day, English couples were being warned not to continue doing energetic “rude American dancing.” Time Magazine reported that American troops stationed in France in 1945 jitterbugged, and by 1946, jitterbug had become a craze in England. It was already a competition dance in Australia.